Nostalgia loves a summer night. On a balmy evening, it’s all too easy to become drunk on the perception of simpler times. People have a tendency to remember the joy of the sunny days while forgetting the storms that inevitably follow. 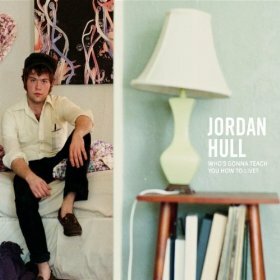 In the midst of a July heatwave, the release of singer-songwriter Jordan Hull’s new album offers a welcome respite, gushing torrents of hard-won truth. Who’s Gonna Teach You How to Live? is a stinging and savvy recording that details all the pleasure and pain of growing into one’s own skin. Hull’s latest recording is an impressive effort. Surrounded by other young talented musicians, the native Ohioan’s far-reaching influences – Delta blues, classic folk, and vintage rock – all converge in one meditative musical package. He posesses a willingness to lay himself bare with a refreshing lack of self-consciousness. His lean, scrappy vocals belie his twenty-two years. The common refrain among Hull’s fans is that he has soul. Perhaps more importantly, he also has heart. Hull’s youth allows him to write directly about coming of age, professing that without personal heartache and mistakes there is no potential for future growth. “Pain turns to sin, sin makes a man,” Hull determines without malice in “Red Lights”, where the narrator seeks solace in darkness following a betrayal by his beloved. The song pulsates with all the urgency that the crumbling of innocence requires. In the rumbling opening strains of the bluesy “O Brother,” Hull observes “trouble coming down the road,” recognizing his own missteps in the actions of others. “I wish I could warn him/but then every story has an end,” he notes of another man’s rashness. However, Hull does not mire himself in regrets: “My life’s behind me/Better start another,” he sings, ready to dive headfirst into a new relationship, even though he realizes it may end badly. That cognizance allows Hull to wink at his own heartbreak. Spirited toe-tapper “Better Judgment” finds a young man lamenting a woman’s ability to jerk his heart around. Nonetheless, he seems resigned to his fate: “Even if it kills, and though it probably will/Well the heart has got reasons of its own,” Hull ruefully muses. Jimmy Spilker rips through an exuberant saxophone solo that counters the melancholy lyrics, transforming the song into a number that could easily pack the dance floor. Similarly, the gentle sway of ”King of Swing” leads into a deceptive sing-along chorus that poignantly contrasts with the narrator’s anguish over another love gone wrong. Eventually, even Hull engages in a bit of good-natured remembrance. He fondly recalls ”Old Days, Warm Places” in the penultimate number on the album. The yearning for the comforts of people and places he’s left behind, however, is met with the acknowledgment that “it’s nearly time I joined up with the past/and faced the fear.” Through his embrace of unknown, he is able to balance the bittersweet nature of change with the pull of the past. There are no easy resolutions in Who’s Gonna Teach You How to Live? The record is a sharp chronicle of a man who savors complexity. Through his unflinching observations on growing up, growing older, and, hopefully, growing wiser, Hull proves to be an artist with an immeasurably bright future.